Village is platted in blocks and streets. It was incorporated in 1926. White Lake High School lists of Graduates. White Lake has had a post office since 1916. Between the villages of Elton and Langlade is situated a prospering and desirable little place called White Lake. Twenty-eight years ago the district of White Lake was void of any permanent settlers. Several logging camps were conducted during the winter months, but there was no settled population. In 1889 Marcus Wahleitner, Sr., came from Elton, Wisconsin to settle upon a farm of one hundred and sixty acres in section twenty-nine. He logged the land the first year and farmed after. In 1891 J.T. Smith bought eighty acres of land in section twenty-nine and after two years moved to a seventy acre farm in section thirty, where he resided ever since. The school house was a little frame building, located on the corner of section twenty-nine and had an enrollment of three pupils the first year. Mr. W.E. Switzer was the teacher during the school year 1893-4. His father, Charles Switzer, logged for the Menasha Wood and Ware Co. and camped on the Evergreen in the John Evans camps. Mr. W.E. Switzer boarded at the camp. That winter the school taught by Mr. Kuhn in the adjoining district was in the need of wood. The men were too busy to cut it, so Mr. Kuhn was compelled to cut his own wood. With the aid of Mr. W.E. Switzer, ten cords of wood were cut. The teachers were paid one dollar a cord and it was with this money Mr. Switzer bought his first watch. In 1893 Joe Kettner bought an eight acre farm. In 1899 Tom Carson bought forty acres. The school had an enrollment of five pupils. In 1902 the enrollment decreased to three. Marcus Wahleithner, Jr., took up his father's farm in 1907. Many farmers bought and settled from then up to the present. In 1908 the Chicago and Northwestern and Wisconsin Northern railroad lines were put through to Van Ostrand. This helped to increase the population of the district, but the people that came did not stay for any length of time. The greater share of the land was owned by the Wallrich Land Company or Menasha Wood and Ware Company. During the year 1908 or 1909, B.C. Larzelere of Antigo and R.G. Johnson of Langlade settled at White Lake. The school at this time had an enrollment of thirty-four pupils. The frame building that was being used was entirely too small and inconvenient for the rapid increase, so they appropriated $3,000 for a new one-room, brick school house. The first term of school began in 1913. Miss Eva Jewell, of Antigo, was the teacher. She taught two terms. In the fall of 1915 rumors of a mill being built near the Lake were whispered around and by the fall of 1916, loud declaration, and preparations were being made to build a mill. R.G. Johnson, Menasha Wood and Ware Company and several other land owners sold their property to the Yawkey-Bissell Lumber Company in order that the company could do their building on the land surrounding the lake. A large boarding house, store, office, forty-two dwelling houses were built by January. In February the Wisconsin Northern railroad moved the depot from Van Ostrand up to White Lake. After the depot was completed, William Gamble, the depot agent was appointed post master, and the post office was put in the depot. This did away with the R.F.D. between Elton and White Lake. The rural route was changed from White Lake to Markton. The building of the new mill caused the population of White Lake to increase so rapidly that the school building erected in 1913 was much too small to accommodate the number of children that were of school age. In January a special meeting of the voters of the district was held and they raised thirteen hundred dollars with which to build a new school building. The Yawkey-Bissell Lumber Company donated four acres of land in section twenty for the school grounds. The school will be a brick building, having one large assembly room and four recitation rooms, also manual training and domestic science departments. In course of twenty-eight years, the District of White Lake has developed from a quiet unsettled little place to a thriving and promising milling town. On the shores of a very picturesque little lake is located the village of White Lake. This village is situated in the town of Elton in township No. 31 north, range No. 14 east. The village comprises of Sec. 20 and 21. This village took its name from the lake which has a bottom of white sand. This lake is fed by large springs and is drained by a swamp creek which empties into the Wolf River at the Second Pitch of Twenty-day Rapids. Around the years 1885 White Lake was surrounded by thick woods and was visited about twice a month by mail carriers. The route the mail was carried on was called the Mississipi trail which led from Green Bay to Lake Superior. The system of carrying mail was by foot. White Lake was used as a half way station between Green Bay and Post Lake. The carriers had a small camp ground cleared on the southeast side of the lake. It used to take two days to come from Green Bay to White Lake. Here a north bound carrier would take the pack to Post Lake. The carriers picked White Lake as their camp because of the fish in the lake. One of the mail carriers was a man by the name of John Hunter. First Logging Camp Mr. John Evans was the first man to make a start in this part of the country. He started a logging camp on Sec. 27. The first winter he logged, he built the shanties of large logs one placed upon the other. The roof was made of shoots or hollow basswood logs split in two. The men did not have any bunks in which to sleep. The beds were made of hemlock boughs placed on the ground. They had no stoves. They were kept warm by a large fire which was built in an opening left in the middle of the camp building. The smoke went out through a large hole left in the roof. Mr. Evans had seventeen yoke of oxen and fifteen pairs of horses. The horses were used for nothing but hauling the logs to the river. If a teamster took a team in the woods to skid with he was fired, because oxen were to be used for skidding and oxen only. It took about five tote teams to keep the camp in supplies. The first sawmill that was built in the town of Elton was by Mr. Evans. It was located on the Evergreen creek on Sec. 30. It was run by oxen and horse power. White Lake was often reached during the hunting season by hunters from Carter, Mountain, Kingston, Breed and other small towns east of here. Wahlleitner First Settler In the year 1889 M. Wahlleithner, St., came here and settled on a piece of land of about one hundred and sixty acres on Sec. 29. The first year he was here he logged off part of the farm and the next summer he started to clear a farm. The farm is now owned by his son, M. Wahlleithner, Jr. There is a clearing of about eighty acres there now. The first law suit that arose in the town of Elton was between John Evans and M. Wahlleithner. The suit was over a pine tree which was on the line. Mr. Evans was logging near and cut the tree and Mr. Wahlleithner wanted pay for the tree, but Mr. Evans said the tree belonged to him. The suit was decided by a jury of twelve men from Mr. Evans' camp. It was decided that Mr. Wahlleithner be paid for the tree. J.T. Smith came here in the year 1889, and bought eighty acres on Sec. 29, but he did not stay here very long. He bought forty acres on Sec. 30, where he still lives. Pioneer Hardships The life of the pioneer farmer was very hard at first. The food such as flour, salt, sugar, etc., had to be brought in at a large expense of time. This was toted either from Antigo or Shawano. Their houses were all built of logs one placed upon the other until it reached the height of about eight feet. The roofs were made waterproof by spit cedar called shakes. They were laid in the same manner as shingles are nowadays, only they were a lot longer and wider. First School House The first school house near White Lake was located a the southeast corner of Sec. 29. (Webmaster Note: This might be in error and should read "northeast"? The school was on highway M and highway M runs one-half a mile away for the SE corner of Sec. 29). It was built in the year 1893. It was a frame building made of lumber which Mr. Evans sawed at his mill. W.E. Switzer was the first teacher in the year 1893-4. Then enrollment of school the first year was three. Then it grew to five, but again dropped to three. Mr. Switzer boarded at a logging camp. At one time Mr. Switzer and a teacher from the Cozy Corner school had to cut wood for the school. They cut two weeks and from the money received from this work Mr. Switzer bought his first watch. Later Comers In 1893 Joe Kettner came and bought forty acres of land near the school house. In 1899 Tom Carson came and bought forty acres and cleared a small farm. In the year 1900 H.C. Scott started a logging camp on Sec. 28. The camps were built of large logs which are still standing and used to live in. The farm is now owned by a potato man by the name of Mr. Mullens. Mr. Scott hauled his logs to the river at first. But when the railroads came through he cleared a landing at White Lake. It was called Siding Thirty-five on the Wisconsin & Northern R.R. this landing and the railroad camps were the first two clearings at White Lake. Coming of Railway. The Wisconsin & Northern and Northwestern R.R. came through White Lake at the same time, which was in the year 1908. The two roads cross here. The Wisconsin & Northern R.R. first ran from Shawano to Van Ostrand. Then the company spent a long time getting a bridge across the Wolf River at the head of the Ox Bow Rapids. This bridge was very hard to build on account of the swift water. The bridge is made of steel and the piers are made of cement. After the bridge was finished the road was extended to Crandon. It was also lengthened from Shawano to Bear Creek. In the year 1918 the road was built to Appleton. Then in 1920 it was extended to Neenah. The road now runs from Neenah to North Crandon Jct. New School House. In the year 1913 a new brick school house was built at the same place as the old frame school house. The building cost $3,000.00 It consists of one large room and a large basement. It is heated by a furnace. The enrollment the first year was thirty-four. The first teacher was Miss Eva Jewell of Antigo. She boarded at Johnson's and Larzelere's, at White Lake. The log cabin was owned by B.C. Larzelere and was among the first buildings built at White Lake. The first brick building at White Lake was built for R.G. Johnson. It is now used as the doctor's office. Mill is Built. In the year 1915 it was whispered around that a mill was to be built at White Lake. In 1916 it was started. Some men were sent here to look at the lake and see if the water could be raised to a higher elevation. It was possible, so the land was cleared and the mill was started. The first building of the Yawkey-Bissel Lumber Co., was the rooming house then, but is now used as a warehouse for the company store. As the mill was being put up the dwelling houses were also built. After the mill was started a boarding house was put up. It is a three story building which is still used for the same purpose. After a few houses were built a store was built. The store has a grocery department, dry goods department and hardware department. About the same time the depot on the Wisconsin & Northern R.R. was moved from Van Ostrand to White Lake. It was moved on two flat cars which were hauled very slowly by a large engine. It was a very difficult job on account of the large curve in the track just north of White Lake. The depot was placed four hundred feet south of where the Wisconsin & Northern crosses the C.& N.W. R.R. After it was placed an addition was built onto it which is used as the women's waiting room at present. Other Improvements. The Yawkey-Bissell Lumber Company built houses till the village has about one hundred. The houses are all painted alike, either a dark brown or white. A new office was built along side of the log cabin which was first used as the office. It is a small office and is located at a very pleasant place on the sore of the lake. The Yawkey-Bissell Lumber Company bought most of their timber from the Menasha Woodenware Company under this form. The Menasha Woodenware people get all the basswood and the Yawkey-Bissell Lumber Company pays stumpage on the rest of the timber. A hotel was also built which is a frame building painted dark brown. This is one thing that White Lake can be proud of. It is a neat hotel. It is run by Mr. and Mrs. Paul Leith. In the year 1917 a large school house was built. This building is made of brick. It is a two story building containing six rooms, three upstairs and three downstairs. The upstairs has a large or main room which has a stage in the front. This main room is used as a study room and the other two are smaller and are used for recitations. There are two rooms in the basement. One is for Manual Training and the other for Domestic Science. The land for the school was donated by the Yawkey-Bissell Lumber Company, which is four acres. It lies east and west from the track to the main road. After the school was finished it was found that the main room was not large enough for a community meeting, so a large club house was built. It is a low, round roofed building. In the basement is a bowling alley and a few pool tables. A new bank has just been built and is doing good business at the present time. This is something that the people have long been waiting for. Mr. V.H. Jolin is banker. He is a man with experience and has made a fine start. Some of the men that own large shares in the Yawkey-Bissell Lumber Company are Mr. Yawkey, Mr. Bissell, Mr. Hammond and Mr. Gamble. Mr. Gamble is head superintendent. Mr. W.D. Cavers is superintendent of the office work, Mr. Sterling is assistant Superintendent, Mr. Ocomers is walker, Mr. Abendshein is manager of the store and Mr. Eschenbauch is manager of the club house. The Standard Oil Company has put up a large filling station. White Lake will have a good chance to be a city of industries for the Wisconsin & Northern R.R. have sold to the Soo Line R.R. and this company is to use this as their main route. The companies are to change hands the first of may, 1921. Some of the future prospects are to build a new high school, also a new town hall, which was voted on this spring. It has also been stated that a paper mill was to be built. This is surely the place for it to be built. Two railroads, plenty of material close by and what more is needed; just water and we have that. It has also been the wish of the people that an elevator be built here as the main shipping point. The roads in this district are fine, which is a good feature for a community to carry. They are always kept in good order, so don't forget to come and visit our city and lakes and fishing streams. All are welcome at all times. Come. Published in Dessureau's 1922 "History of Langlade County..."
When Isaac Farrow, pioneer Elton citizen, attempted to drain White Lake to create a natural hay meadow out of its level bottom in 1876, little did he dream that the shores of the same lake would a half century later be the site of a prosperous village wherein dwell 700 inhabitants. If George Gardner, Stockbridge Indian, who kept a stopping place on the old Lake Superior Trail and the Military Road fifty years ago, near what is now White Lake, could return to earth and visit this region he would have difficulty in locating the old trail and the site of his "ranch." (see Chapter on Stopping Places-Hotels-Taverns). Marcus Wahleitner, Sr., came into this district in 1889 from Elton village, settling on section 29. John Evans operated a saw mill in this district until 1895. Much of the labor about this mill, one of the first in eastern Langlade County, was accomplished with the assistance of oxen. The mill was moved to Lily in 1895. In 1891 T.F. Smith purchased eighty acres on section 29. Joseph Kettner settled in the district in 1893 and Thomas Carson in 1899. Charles Switzer, father of W.E. Switzer of Wabeno, Forest County, who headed the Langlade County normal for a number of years, logged in this district in 1893 for the Menasha Woodenware Company. The first school was erected on section 29. W.E. Switzer was an early teacher. Three pupils attended the first school. In October, 1907, the village plat of Van Ostrand, proposed town of E.H. Van Ostrand, was surveyed by Alex Deleglise. The village contained 41 blocks and was owned by the Van Ostrand Town Site Improvement Company. Adams, Hayes, Madison, Harrison, Jackson, Van Buran, Grant, Monroe, Lincoln, Jefferson, Buchanan and Washington streets were laid out. Avenues from first to tenth inclusive were platted. Lots were sold but the purchasers sold back to the improvement company when Van Ostrand village was abandoned. 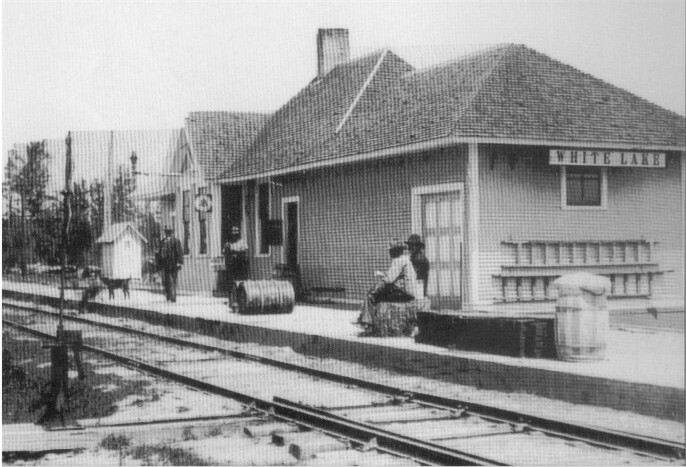 A depot was built by the Wisconsin Northern railroad at the village site in 1908. The line then ended at Van Ostrand. A brick school was erected in 1913 at a cost of $3,000 when the frame structure, inadequate and small, was vacated. The school enrollment had increased in six years from a few pupils to thirty-four. This school is under the jurisdiction of the school board in charge of the White Lake village schools. It is located on section 29. A year before the Yawkey-Bissell Lumber Company, lumber kings of Wisconsin for a half century, located, rumors floated about to the effect that a large saw and planing mill would be erected at White Lake. The rumors became facts when in July, 1916, the Yawkey-Bissell Lumber Company began clearing land east of White Lake for a village and mill site. August 16, 1916, work was started on the large saw mill which commenced operation June 1, 1917. A year later ground was broken (August, 1917) for the planing mill which was completed and in operation January 1, 1918. Following the mill came the hotel which was erected in the winter of 1917-18. It is managed by Mrs. Paul Leitl. The lumber concern also has a boarding house where many employees live. R. Pagel conducts it. In September, 1916, the depot erected at Van Ostrand by the Wisconsin & Northern railroad was moved to White Lake and W.H. Gamble became the first agent. A store was built by the lumber company in November, 1916. William Obendschein is in charge of the store and Julius Strauch of the meat market. A barber shop is operated by P.J. Reis. In August, 1917, the C. & N. W. railroad Company built a depot at White Lake. The Yawkey-Bissell Lumber Company office was erected in 1916 and by January 1, 1917 was completed. A splendid club house, dance hall and community center building was erected at an approximate cost of $15,000 in 1918-19. It was opened June 1, 1919. 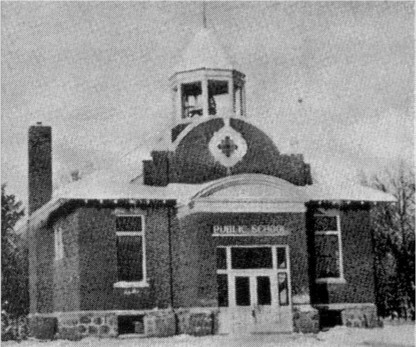 The White Lake graded school was opened October 1, 1917. The school was built at a cost of $13,000. In 1921 a union free high school , including about two-thirds of Elton township, was organized in the village. Ten teachers have charge of the White Lake schools. The large enrollment is increasing every year. The White Lake rural school is still used on section 29. For three years it was vacated. W.D. Cavers, Director, B.C. Nelson, Clerk and H.F. De Horn, Treasurer were the 1921-22 officers in charge of the high school, White Lake graded and White Lake rural schools. White Lake has 110 families. Shipping facilities are good. Passenger service is not. The Yawkey-Bissell Lumber Company have enough timber in Langlade and Forest Counties to run until 1944. 15,000 acres were purchased in 1916 from the Menasha Wooden Ware Company. Most of this timber is in Langlade County. In 1919, 18000 acres were purchased from the Kimberly-Clark Company. This tract is in Forest County. Smaller tracts were purchased from the Oconto Lumber Company, the C. & N. W. Railroad Co., and the S.W. Hollister estate. Two camps operate all year around. Peter O'Connor, early Antigo citizen, whose wife was the first Antigo school teacher, is Wood Superintendent for the lumber concern. J.C. Horgen was the first manager at the store. The Yawkey-Bissell Lumber Company has ten miles of track connecting their camps in the southern part of Evergreen township with the mills at White Lake. Annual cut is 30 million feet, while the capacity of the mill is 60 million feet. The Military Road Telephone Company serves this district. Dr. W.E. Ellis is the present doctor. Dr. Clayton Charles was the first doctor in the village. White Lake has two churches and three church organizations. The St. Mathews Lutheran church, erected in 1917, has Rev. A. Hoswald as resident Pastor. The St. James Catholic church, erected in 1920 is in charge of Rev. Victor Happa (Hoppa?) Rev. J. Landusky was Presbyterian faith is represented by a local organization. Services are held monthly in the club house with Rev. Westphal of Neenah as Pastor. White Lake is 35 miles from Shawano, 32 miles from Antigo and 40 miles from Crandon. 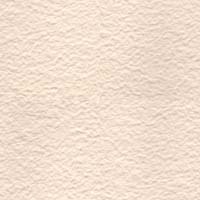 It is on section 16, township 31, range 14 east. The nearest point of the Wolf river is about one mile. The White Lake Bank is discussed in the chapter on Banks and Finance. Many of the residents of White Lake have been employed for years by the Yawkey-Bissell Lumber Company, who at the beginning of the twentieth century had large saw and planning mills at Arbor Vitae, Vilas County and Hazelhurst, Oneida County. Employees at the Yawkey-Bissell Lumber Company general offices at White Lake are: E.G. Woodford, Sales Manager; O.A. Olmholt, Assistant Sales manager; L.E. Prahl, Stenographer; Charles W. Wicksrrom, Bookkeeper; John Anderegg, Timekeeper; W.D. Cavers, Auditor and E.D. Sterling, General Superintendent. J. Collins and W.J. Edwards are in charge of camps. Wm. Obendschein is the postmaster. Antigo Daily Journal, July 1, 2002, Prime Time Supplement, "White Lake Mill Has A Long, Storied History"
Antigo Daily Journal, August 5, 2002, PrimeTime Supplement, "White Lake Mill Has A Rich and Coloful History"
Antigo Daily Journal, October 7, 2002, PrimeTime Supplement, "Recollections...Gamble, Grimes Families"
Antigo Daily Journal, November 4, 2002, PrimeTime Supplement, "White Lake Families Included Juettens, Larzeleres"
Antigo Daily Journal, January 6, 2003, PrimeTime Supplement, "Families of White Lake include Notbohms, Ramers"
Antigo Daily Journal, April 5, 2004, PrimeTime Supplement, "Local Society Preserves Colorful White Lake Lore"
Antigo Daily Journal, June 7, 2004, PrimeTime Supplement, "White Lake Enters Logging, Farming Heyday"
Antigo Daily Journal, July 6, 2004, PrimeTime Supplement, "White Lake Pioneers Struggle, but Surviving"
Antigo Daily Journal, August 2, 2004, PrimeTime Supplement, "The Years 1920 to 1930..."
Antigo Daily Journal, September 7, 2004, PrimeTime Supplement, "The Years 1930 to 1940..."
Antigo Daily Journal, October 4, 2004, Prime Time Supplement, "The Years 1950 to 1950..."
Antigo Daily Journal, October 1, 2005, Hidden Places Series, "White Lake Robbins Flooring Plant. In early days the Yawkey-Bissell Lumber Co."
Antigo Daily Journal, November 26, 2005, Hidden Places Series, "The Old White Lake Boarding House/Logger's Hotel."